Schoolgirl ISIS bride Shamima Begum has been granted taxpayer-funded legal assistance in her bid to overturn the decision to revoke her British citizenship—even though she hasn’t asked for it. Begum travelled to Syria at the age of 15 from the UK to join the so-called caliphate. Her citizenship was revoked by the Home Secretary following a series of interviews she gave from a refugee camp in which she expressed little remorse but said she wanted to return to the UK. Her family filed a legal appeal to restore her citizenship, and according to the BBC, lawyers have now successfully applied for funding to fight her case. The decision has been slammed by some lawmakers, who are demanding a change to the rules, which allowed lawyers to successfully apply for potentially hundreds of thousands of pounds to fight for Begum’s return to the UK without receiving any formal instruction from her. The British legal system allows anyone who is a plaintiff in a British court–whether they are a citizen or not—to apply for legal funding if they cannot afford a lawyer. According to the BBC, the case could last for years. Begum traveled to Syria as a schoolgirl, aged just 15, from her home in London. She gave birth in a Kurdish refugee camp, after sparking controversy with a number of interviews. In her interviews, she indicated she wanted to return to the UK but expressed little remorse or indication that she had shed the caliphate’s ideology. 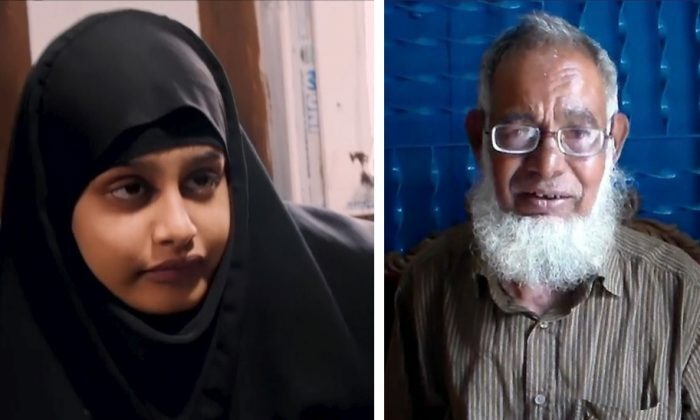 Begum worked for al-Hisba, according to sources who told the paper she enforced the terror cult’s strict dress code with an AK-47 she carried with her and had a reputation as a strict enforcer. The Telegraph quoted an activist who recounted how Begum allegedly shouted at Syrian women in the city of Raqqa for wearing brightly colored shoes. The report also claims Begum played a part in persuading other women to join the jihadi cause.